A new production of a Mamet classic. Ray Anthony Thomas, Johnny Wu, Manu Narayan and Jeff Marlow, photo by Craig Schwartz. Peter Maloney (left) as â€œShelly Leveneâ€ and Johnny Wu as â€œJohn Williamsonâ€ photo by Craig Schwartz. David Mamet is a brilliant and fearless playwright. He’s also a playwright who never met or wrote a four-letter word that he didn’t like. He has always been a playwright of, and for, the people and one who loves to zero in on subjects and situations that less daring and less confident playwrights feel no obligation to tackle. I’m surprised, however, to learn that a Mamet play has never been performed at The La Jolla Playhouse, one of this country’s premiere Regional Theatres – until now. 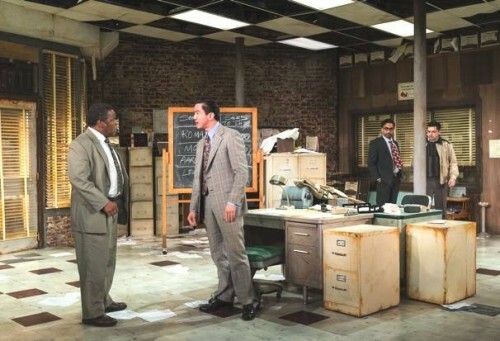 Thankfully, Artistic Director Christopher Ashley has remedied that past oversight by directing a wonderfully scathing and corrosive examination and profile of the “American salesman” with his production of “Glengarry Glen Ross” that just opened at the Sheila and Hughes Potiker theatre. The story and the action take place in a Chicago real estate office in 1983, where a group of salesmen are pitted against one another for more sales in the pursuit of their piece of the American dream. It’s a cold, hard, reality choice to face every day when they come to work. It’s a case of perform and excel or you’re out on the street at the end of the day. Unfortunately, for them, rules governing the dream are rigged in favor of their managers. 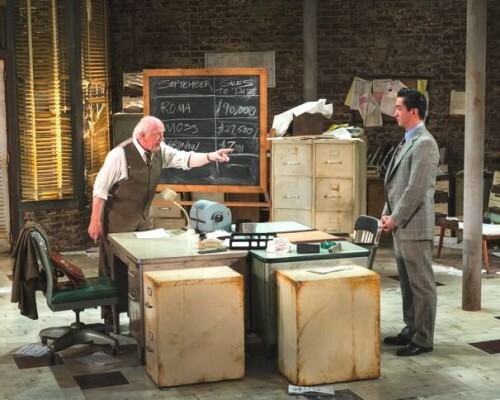 “Glengarry Glen Ross” is a 90-minute gem of a play about power and who’s on top. It’s also well known for its excessive profanity, but it is also one of America’s great character plays. Ashley has assembled a wonderfully talented and gifted cast of diverse looking actors, who fit their back-stories to a T. It’s fascinating to watch this ensemble group of performers who thoroughly understand the playwright’s dramatic intentions and dialogue, which has been referred to over the years as “Mametspeak”. Translation: it’s vulgar at times (loaded with f-bombs), but always honest, and it’s usually delivered at warp speed. 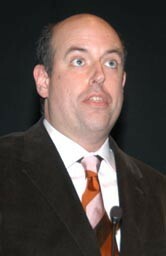 Peter Maloney playing Shelly “The Machine” Levene, is the epitome of a Mamet loser. Once the top dog in the office, now he’s the older, pushed-aside-by-management, also-ran who’s hanging on just to survive. Maloney’s performance is full of sympathy, desperation, and adrenaline – a potent winning combination for an actor. Manu Narayan as Richard Roma, explodes onto the stage bristling with confidence and satisfaction at his recent $90,000 “score” and sale. However, once his solid sale evaporates, thanks to the inexperience of young and duplicitous office manager and chief torturer of Shelly, John Williamson (JohnnyWu), Roma’s anger and condemnation reach titanic proportions. One does not want to be on the receiving end of Roma’s withering tirade about incompetence. It’s an electrifying performance. James Sutorius portrays disgruntled salesman/instigator/office provocateur Dave Moss, whose suggestion that perhaps, somebody ought to break into the office, steal the best sales leads, then either sell or keep them, and make it look like a burglary which would help everyone – but he keeps suggesting to George Aaronow, (Ray Anthony Thomas), that George has to be the one to do it. Every business or office in the world has a Dave Moss working somewhere in it. James Lingk (Jeff Marlow), Roma’s $90K score has a bad case of buyer’s remorse and comes into the office looking for Roma to get his money back. Fat chance. We feel for Lingk’s predicament, but the old adage that a fool and his money are soon parted is the inevitable result of what happens when a con man meets a potential customer with little or no sales resistance. Matt MacNelly, as Baylen, the police detective sent to investigate the burglary rounds out the cast. 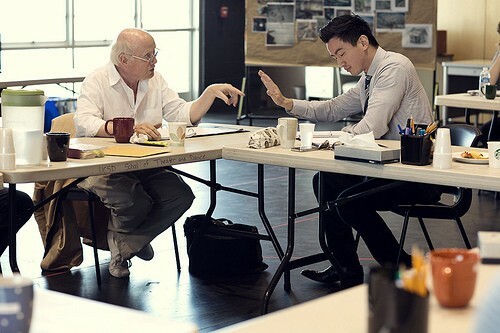 Director Ashley’s selection of “Glengarry Glen Ross” as the first Mamet play to be produced at the Playhouse is a solid and relevant one. It’s a revealing and resonating look backward to the 1980’s and the country’s financial woes during that time. As the saying goes…what goes around, comes around. It’s now 2012 and since 2008 we’ve been struggling once more with the country’s economy. Instead of real estate leads we’re now dealing with derivatives, hedge funds, and underwater mortgages. The creative team led by Ashley’s personal vision features a clever and functional set design by Todd Rosenthal that includes a restaurant and a real estate office setting. Lighting by designer David Lander, with costumes by Toni Leslie James, and sound design by David Corsello lend solid technical support to this excellent production. “Glengarry Glen Ross” runs at the Sheila and Hughes Potiker theatre through October 21st. Tickets may be obtained by calling 858-550-1010 or go online at www.lajollaplayhouse.org . This review is reposted from Desert Local News courtesy of Jack Lyons.